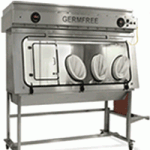 Germfree’s Laminar Flow Glovebox/Isolator (LFGI) Series is USP 797/800 and NIOSH compliant. These units were developed for superior product, patient and personnel protection. An advanced ergonomic design ensures maximum user comfort. The units can operate under positive or negative pressure. 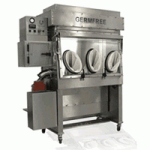 Germfree’s VersaFlow Series is the most practical solution to USP 797/800 compliance for hospital pharmacy and cleanroom environments and is ideal for TPN auto-compounders. The Laminar Flow Glovebox/Isolator (LFGI) provides the ultimate in both product and operator protection. Germfree’s LFGI functions as a Compounding Aseptic Containment Isolator (CACI), while operating under a strong negative pressure to meet NIOSH recommendations. Additionally, the unit functions as an Isolator under positive pressure to meet USP 797 regulations. The operator is provided a complete barrier from materials being manipulated in the work area through the use of a highly ergonomic glove system. HEPA-filtered air bathes the complete work area to protect the product from contamination. This unidirectional, laminar flow air removes any particulates generated by sample manipulation. The LFGI Series Glovebox/Isolator meets or exceeds ISO 14644-1 for Class 5 air quality. The VersaFlow provides the most practical and versatile solution for I.V. compounding in the hospital pharmacy and cleanroom. While operating under positive pressure, the VersaFlow functions as a Compounding Aseptic Isolator (CAI) to meet USP 797 regulations. The complete work area and transfer chamber is bathed by HEPA-filtered air, protecting the product from contamination. This unidirectional, laminar flow air removes any particulates generated by sample manipulation. Germfree’s VersaFlow Series of Barrier Isolators meet or exceed ISO 14644-1 for Class 5 air quality.